I like to have two complementry pages facing in my album, so I have made two pages, one more suitable for a journal entry , the other for a photograph. They are fairly plain, so suitable for both a male or female subject. The pages are eight inches by eight inches in .png format at 200 dpi suitable for a small album or for the centre of a twelve inch page. You are so very good at creating this vintage look which isn't the typical vintage look you find elsewhere. Very unique and truly beautiful, Judy. These are just beautiful. Any chance we could talk you into making a few more matching with perhaps two ovals for two pictures per page? 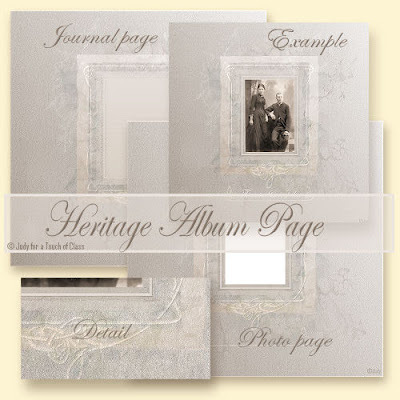 I research the family tree and would love to put together albums for the family using these pages. Just beautiful!! Such a wonderful set of pages! The style is very unique and exactly what I'm looking for. I too scrap heritage photos and these are perfect! Love the texture, too. Please continue sharing these types of pages. We all appreciate it very much. What do I think of them? I love them. I am in the middle of making an album for Christmas for my sister-in-law of her parents and grandparents. This will be perfect. Wow--your designs are truly beautiful--thanks! Excellent work!!!! Thank you so much for sharing. I love your graphics. Yeah! What they Said - you truly have a gift for making these pages so subtle and beautiful! Thanks! Thanks so much. Just what I've been looking for.